For other people with the same name, see Fatima (name). Fatimah bint Muhammad (/ˈfætəmə, ˈfɑːtiːˌmɑː/; Arabic: فاطمة‎‎ Fāṭimah;[pronunciation 1] born c. 605 or 615 – died 28 August 632) is the youngest daughter of the Islamic Nabi (Arabic: نَـبِي‎‎, Prophet) Muhammad and Khadijah, therefore, one of the members of Muhammad's Bayt (Arabic: بـيـت‎‎, 'Household'). She was a wife of ‘Ali and mother of Al-Hasan and Al-Husayn. She is the object of the veneration, love, and respect of all Muslims, as she was the child closest to her father and supported him in his difficulties, was the supporter and loving caretaker of her own husband and children, and was the only child of Muhammad to have male children live beyond childhood, whose descendants are spread throughout the Islamic world and are known as Sayyids. The 11th century dynasty ruling Egypt at the time of the Crusades, the Fatimids, claimed descent from her. For Muslims, Fatimah is an inspiring example and 'Fatimah' is one of the most popular girl's names throughout the Muslim world. Fatimah is a vital character in the religion of Islam and is considered a role model for all Muslim women. Although there is controversy between different sects of Islam regarding her political role, she is the daughter of Muhammad and is loved and venerated by all Muslims. Fatimah was born in Mecca to Khadija, the first of Muhammad's wives. There are differences of opinion on the exact date of her birth, but the widely accepted view is that she was born five years before the first Quranic revelations, during the time of the rebuilding of the Kaaba in 605, although this does imply she was over 18 at the time of her marriage, which was unusual in Arabia. Twelver Shia sources, however, state that she was born either two or five years after the first Qur'anic revelations, but that timeline would imply her mother was over fifty at the time of her birth. Fatimah had three sisters named Zainab, Umm Kulthum, and Ruqayyah and two brothers named Tayyab and Qasim respectively. While Sunnis believe Zainab, Ruqayyah, and Umm Kulthum to be the other daughters of Muhammad, Shias believe that they were actually the daughters of Hala, the sister of Khadijah, who were adopted by Muhammad and Khadijah at her death. A strong reason given by the Shi'a scholars for this belief is the event of (Mubahala) mentioned in the Quran, in which there is no reference of the presence of any other female apart from Fatimah, however Sunnis accept that Muhammad had four daughters all from Khadijah. Iranians celebrate Fatima Zahra’s birth anniversary which is also designated as Mother's Day in the country. Fatimah is given many titles by Muslims to show their admiration of her moral and physical characteristics. The most used title is "al-Zahra", meaning "the shining one", and she is commonly referred to as Fatimah Zahra. She was also known as "al-Batul" (the chaste and pure one) as she spent much of her time in prayer, reciting the Qur'an and in other acts of worship. Besides, amongst 125 famous veneration titles, she has also been honored with the title of Umm-ul-Aaima (Mother of Imams). Following the birth of Fatimah, she was personally nursed, especially she was brought up by her father; contrary to local customs where the newborn were sent to "wet nurses" in surrounding villages. She spent her early youth under the care of her parents in Mecca in the shadow of the tribulations suffered by her father at the hands of the Quraysh. One time, while Muhammad was performing the salat (prayer) in the Kaaba, Amr ibn Hishām (Abu Jahl) and his men poured camel placenta over him. Fatimah, upon hearing the news, rushed to her father and wiped away the filth while scolding the men. Following the death of her mother, Fatimah was overcome by sorrow and found it very difficult to come to terms with her death. She was consoled by her father, who informed her that he had received word from angel Gabriel that God had built for her a palace in paradise. Many of Muhammad's companions asked for Fatimah's hand in marriage, including Abu Bakr and Umar. Muhammad turned them all down, saying that he was awaiting a sign of her destiny. Ali, Muhammad's cousin, also had a desire to marry Fatimah. When he went to see Muhammad, he could not vocalise his intention but remained silent. Muhammad understood the reason for his being there and prompted Ali to confirm that he had come to seek Fatimah in marriage. He suggested that Ali had a shield, which if sold, would provide sufficient money to pay the bridal gift (mahr). Muhammad put forward the proposal from Ali to Fatimah, who remained silent and did not reject the proposal like the previous ones. Muhammad took this to be a sign of affirmation and consent. The actual date of the marriage is unclear, but it most likely took place in 623, the second year of the hijra, although some sources say it was in 622. The age of Fatimah is reported to have been 9 or 19 (due to differences of opinion on the exact date of her birth i.e. 605 or 615) at the time of her marriage while Ali was between 21 and 25. Muhammad told Ali that he had been ordered by God to give his daughter Fatimah to Ali in marriage. Muhammad said to Fatimah: "I have married you to the dearest of my family to me." Ali sold his shield to raise the money needed for the wedding, as suggested by Muhammad. However, Uthman ibn Affan, to whom the shield was sold, gave it back to Ali saying it was his wedding gift to Ali and Fatimah. Muhammad himself performed the wedding ceremony and two of his wives, Aisha and Umm Salama, prepared the wedding feast with dates, figs, sheep and other food donated by various members of the Madinan community. According to Hossein Nasr, their marriage possesses a special spiritual significance for all Muslims because it is seen as the marriage between the greatest saintly figures surrounding Muhammad. Their marriage lasted about ten years and ended when Fatimah died. Although polygyny is permitted by Islam, Ali did not marry another woman while Fatimah was alive. After her marriage to Ali, the couple led a humble life in contrast to her sisters who were all married to wealthy individuals. Ali had built a house not too far from Muhammad's residence where he lived with Fatimah. However, due to Fatimah's desire to be closer to her father, a Medinan (Haritha bin al-Numan) donated his own house to them. For several years after her marriage, she did all of the work by herself. The shoulder on which she carried pitchers of water from the well was swollen and the hand with which she worked the handmill to grind corn were often covered with blisters. Fatimah vouched to take care of the household work, make dough, bake bread, and clean the house; in return, Ali vouched to take care of the outside work such as gathering firewood, and bringing food. Ali worked to irrigate other peoples lands by drawing water from the wells. Their circumstances were akin to many of the Muslims at the time and only improved following the Battle of Khaybar when the produce of Khaybar was distributed among the poor. When the economic situations of the Muslims become better, Fatimah gained some maids but treated them like her family and performed the house duties with them. Another reference to their simple life comes to us from the Tasbih of Fatimah, a divine formula that was first given to Fatimah when she asked her father for a kaneez (servant girl) in order to help her with household chores. Her father asked her if she would like a gift instead that was better than a servant and worth more than everything in the world. Upon her ready agreement, he told her to recite at the end of every prayer the Great Exaltation, Allahu Akbar 34 times, the Statement of Absolute Gratitude, Alhamdulillah 33 times and the Invocation of Divine Glory, Subhan'Allah 33 times, totalling 100. This collective prayer is called the Tasbih of Fatima. In contrary with what Sunni says, in Shia literature there are some speeches from Ali that deny any problem with his spouse. For instance, Ali has sworn to the God, " I never did any act that make Fatimah angry and she never made me angry too." Shia acknowledge the saying of Muhammad, "Fatimah is a part of me and whoever offends her offends me", but the context of the reporting in reference to Ali is disputed, like Abu Muhammad Ordoni quotes in his book: "Among the many fabricated stories told against Ali was that he had asked for Abu Jahl's (the chief of infidels) daughter's hand in marriage. When this news reached Fatimah, she rushed to her father who found out the falsity of the story." The Shia say this statement was used by Fatimah herself when she spoke to Abu Bakr and Umar, stating that they had both displeased her. Following the Battle of Uhud, Fatimah tended to the wounds of her father and husband, and took it upon herself to regularly visit the graves of all those who died in the battle and pray for them. Fatimah, along with her husband, was also called upon by Abu Sufyan to intercede on his behalf with Muhammad while attempting to make amends following the violation of the Treaty of Hudaybiyyah. Abu Sufyan also asked for Fatimah's protection when she went to Mecca while it was under occupation which she refused under instruction from her father. Some verses in the Qur'an are associated to Fatimah and her household by classical exegetes, although she is not mentioned by name. According to J. D. McAuliffe, two of the most important verses include the verse of purification, which is the 33rd ayah in sura al-Ahzab and the 61st ayah in sura Al-i-Imran. In the first verse, the phrase "people of the house" (ahl al-bayt) is ordinarily understood to consist of Muhammad, Fatimah, her husband Ali and their two sons (al-Tabari in his exegesis also mentions a tradition that interprets "people of the house" as Muhammad's wives; for Ibn al-Jawzi, the order of these options is reversed). The second verse refers to an episode in which Muhammad proposed an ordeal of mutual adjuration (Mubahala) to a delegation of Christians. Fatimah, according to the "occasion for the revelation" of this verse, was among those offered by Muhammad as witnesses and guarantors. Muslim exegesis of the Qur'anic verse 3:42, links the praise of Mary, the mother of Jesus, with that of Fatimah based on a quote attributed to Muhammad that lists the outstanding women of all time as Mary, Asiya (the wife of Pharaoh), Khadija and Fatimah. For the few months that she survived following the death of her father, Fatimah found herself at the center of political disunity. There are differing accounts of how the events surrounding the commencement of the caliphate led to the Shia and Sunni split. According to the Sunnis the majority of Muslims favored Abu Bakr as the Caliph following his selection to the caliphate after a meeting in Saqifah at the time of Muhammed's death; whereas a portion of the population supported Fatimah's husband, Ali. Shia historians hold that Umar called for Ali and his men to come out and swear allegiance to Abu Bakr. When they did not, Umar broke in, resulting in Fatimah's ribs being broken by being pressed between the door and the wall causing her to miscarry Muhsin which led to her eventual death. Another Shia version of the events says that Umar sent a force led by his slave-boy Qunfud to Fatimah's house instructing them to bring Ali to the mosque. Arriving at the house, Qunfud requested permission to enter, which was refused by Ali causing Qunfud to return to Abu Bakr and Umar and relate the events, who instructed them to go back and enter the house by force if necessary. Qunfud and his men returned but were this time refused permission by Fatimah which caused Qunfud to send his men back to Abu Bakr and Umar for further instructions who told them to burn the house down if necessary in order to bring Ali to them. Shi'as hold the beliefs that she was involved in three significant political actions. First, after the conquest of Mecca, she refused her protection to Abu Sufian; Second, after Muhammad's death, she defended Ali’s cause, fiercely opposed the election of Abu Bakr, and had violent disputes with him and particularly with Umar; Third, she laid claim to the property rights of her father and challenged Abu Bakr’s categorical refusal to cede them, particularly Fadak and a share in the produce of Khaybar. "Unlike the ascetic who has renounced the affairs of the world, both the historical and hagiographical sources about Fatima al-Zahra document her active participation in domestic and public life. One particular event is recounted in all of the histories both Shiʿi and Sunni: the dispute over the land Fatima received from her father at Fadak...her knowledge of her legal rights and desire for justice indicate that she was a woman involved in the affairs of society". After the death of her father, Fatimah approached Abu Bakr and asked him to relinquish her share of the inheritance from Muhammad's estate. Fatimah expected the land of Fadak (situated 30 mi (48 km) from Medina) and a share of Khaybar would be passed onto her as part of her inheritance. However, Abu Bakr rejected her request citing a narration where Muhammad stated that prophets do not leave behind inheritance and that all their possessions become sadaqah to be used for charity. Fatimah was upset at this flat refusal by Abu Bakr and did not speak to him until her death (however some Sunni sources claim she had reconciled her differences with Abu Bakr before she died). Shias contend that Fadak had been given to Fatimah by Muhammad and Abu Bakr was wrong in not allowing her to take possession of it. Sunnis believe that Fatimah reconciled her differences with Abu Bakr prior to her death, while Shia Muslims believe that her anger with him remained. After our Master had honored the world of the Hereafter, Fatima would neither eat nor drink and she forgot all laughter and joy. She had an apartment built for her in which she stayed by night and day, weeping her heart out for her beloved father. Following the Farewell Pilgrimage, Muhammad summoned Fatimah and informed her that he would die soon, and also told her that she would be the next of his household to die. 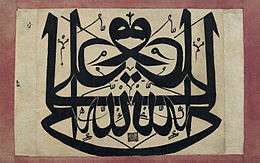 After Mohammad's subsequent passing, Fatimah was grief-stricken and remained so until she herself died less than six months later, on 10th, Jumada al-awwal (as per Fatimid). She passed the time sobbing and sighing and nothing could take away her grief. As soon as she had done her household chores and taken care of her husband, 'Ali, and their sons, Hasan and Husain, she would continue weeping: "O my beloved father! To whom have you left your Fatima?" Six months went by in this fashion till Fatima got so thin that there was nothing left of her but skin and bones. Shia believe that Fatima died as a result of injuries sustained after her house was raided by Umar ibn al-Khattab who shi'a accuse of 'threatening to set fire to the house'. The door was rammed open by one of the assailants knocking Fatimah to the ground. This attack is said to have cracked her rib-cage whilst she was pregnant, causing her to miscarry. According to Shia tradition, Muhammed appeared in a dream and informed Fatimah that she would be passing away the next day. Fatimah informed her husband Ali of her impending death, and asked him not to allow the oppressors to be involved in her ceremonial prayers janazah (prayer performed in congregation after the death of a Muslim) or take part in the burial. Sunni Muslims, who regard Abu Bakr and Umar as revered figures, and the Zaidiyyah Shia reject this version of events. According to some sources, on the morning of her death, she took a bath, put on new clothes and lay down in bed. She asked for Ali and informed him that her time to die was very close. Upon hearing this news, Ali began to cry but was consoled by Fatimah who asked him to look after her two sons and for him to bury her without ceremony. It is further stated that her two sons were the first family members to learn of her death and immediately proceeded to the mosque to inform their father. Upon hearing the news, Ali fell unconscious. After recovering he followed Fatima's wishes and performed the janazah. He buried her during the night on 13 Jumada al-awwal 11 AH (632 AD), also making three false graves to ensure her real grave could not be identified. With him were his family and a few of his close companions. After her death, Ali followed her wishes and buried her without informing the Medinan people. But perhaps most painful of all in those months after the loss of her third son was the ostracism she suffered ordered by Abu Bakr to force Ali into line. [...] When she knew death was close she asked Ali for a clandestine burial [...] Abu Bakr was not to be informed of her death she said. he was to be given no chance to officiate at her funeral. Twelver Shi'a, especially Iranians, hold ceremonies every year for 20 days in Jumada al-awwal to commemorate the anniversary of the martyrdom of Fatimah. Mourners march in procession through the streets to reaffirm their allegiance to the ideals of Fatima. Fatimah's burial place is a disputed issue among Muslims from different sects. It is said that Ali ibn Abi Taleb buried his wife in an unknown location, because it was Fatimah's decision . According to Madelung in The Succession to Muhammad, the secret burial was done with the aim of avoiding the presence of caliph (Abu Bakr). Different locations have been mentioned as the possible burial places of Fatimah some of which are said to be nearer to fact. Al-Baqi', her house and between the Prophet’s tomb and his minbar are the possible places of her grave. Fatimah was survived by two sons, Hasan and Husayn, and two daughters, Zaynab and Umm Kulthum. Controversy surrounds the fate of her third son, Muhsin. Shias  and some sunni scholars such as ibn Abi l-Hadid  say that she miscarried following an attack on her house by Abu Bakr and Umar, while other Sunnis insist that Muhsin died in his infancy of natural causes. Modern descendants of Muhammad trace their lineage exclusively through Fatimah, as she was the only surviving child of Muhammad (According to Shias. Sunni and some Shia believe Muhammad had 4 daughters). Muhammad had no sons who reached adulthood. Fatimah's descendants are given the honorific titles Sayyid (meaning lord or sir), Sharif (meaning noble), and respected by both Sunni and Shi'a, though the Shi'as place much more emphasis and value on the distinction. Muslims regard Fatimah as a loving and devoted daughter, mother, wife, a sincere Muslim, and an exemplar for women. It is believed that she was very close to her father and her distinction from other women is mentioned in many hadith. After Khadijah, Muslims regard Fatimah as the most significant historical figure, considered to be the leader (Arabic: Sayyidih) of all women in this world and in Paradise. It is because of her moral purity that she occupies an analogous position in Islam to that Mary occupies in Catholic Christianity. She was the first wife of Ali, whom Sunnis consider the fourth Rashidun caliph and Shias consider the first infallible Imamah, the mother of the second and third Imams, and the ancestor of all the succeeding Imams; indeed, the Fatimid Caliphate is named after her. Fatimah, regarded as "the Mother of the Imams", plays a special role in the Shia religion. She has a unique status as Muhammad's only surviving child, the wife of Ali, their first Imam, and the mother of Hasan and Husayn. The chapter of Quran on abundance (Sūrat al-Kawthar) mentions the significance of her birth and recognizes her as the only surviving child of Muhammad. The Fatimid Caliphate/ Imamate is named for her. She is believed to have been immaculate, sinless, and a model for Muslim women. Although leading a life of poverty, the Shia tradition emphasizes her compassion and sharing of whatever she had with others. Shias greatly respect her, and her character shines as one of the most brave and courageous in Islamic history. Fatimah stood as the lone defender of Muhammad's declaration of Ghadeer. She put forward her arguments to prove Fadak as her right and undisputed property amongst those who had killed her unborn child Mohsin. According to Mahmoud Ayoud, the two main images of Fatimah within the Shia tradition are those of the "Eternal Weeper" and "the Judge in the hereafter". According to Shia tradition, the suffering and death of Fatimah was the first tragedy of Islam. She spent her last days mourning the death of her father. Fatimah eternally weeps at the death of her two sons, who were murdered by the Umayyads. Shias believe they share in Fatimah's suffering by weeping for her sorrows. It is believed that the tears of the faithful console Fatimah. Shias hold that Fatimah will play a redemptive role as the mistress of the day of judgment in the hereafter, as a reward for her suffering in this world. ↑ Amoli, Seyyed Jafar Morteza. الصحیح من سیره النبی الاعظم‎ [True Biography of the Prophet Muhammad]. 1. pp. 351–350". 1 2 3 4 5 6 7 8 9 10 11 12 13 14 15 16 17 18 19 20 21 22 23 "Fatimah", Encyclopaedia of Islam. Brill Online. 1 2 "Al-Zahraa (A.S.) in her Grandchild's Speech". 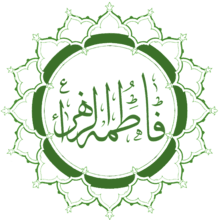 Al-Maaref Islamic Net. May 11, 2011. Retrieved May 21, 2015. 1 2 3 Nasr, Seyyed Hossein. "Ali". Encyclopædia Britannica Online. Encyclopædia Britannica, Inc. Retrieved 2008-10-12. ↑ اربلی, محدث. کشف الغمة في معرفة الأئمة. pp. Vol1, 363. ↑ ibn Qutayba, Abu Muhammad. Al-Imama wa-al-siyasa. 1. Dar ul-marifa. p. 14.
al-Qurashi, Baqir (2006). The Life of Fatimah az-Zahra. Ansariyan Publications. pp. 240–241. Ordoni, Abu-Muhammad (1992). "52". Fatima the Gracious. Ansariyan Publications. p. 255. 1 2 Ordoni, Abu-Muhammad (1992). "47". Fatima the Gracious. Ansariyan Publications. pp. 205–207. 1 2 al-Qurashi, Baqir (2006). The Life of Fatimah az-Zahra. Ansariyan Publications. pp. 217–220. ↑ Karen Ruffle, “May You Learn from Their Model: The Exemplary Father-Daughter Relationship of Mohammad and Fatima in South Asian Shiʿism. ” Journal of Persianate Studies 4 (2011): 12-29. ↑ Ozak, Muzaffer (1988). Irshad: Wisdom of a Sufi Master. Amity House, Incorporated. p. 204. ISBN 978-0-916349-43-1. ↑ Ordoni, Abu-Muhammad (1992). "54". Fatima the Gracious. Ansariyan Publications. p. 261. ↑ Ordoni, Abu-Muhammad. "47". Fatima the Gracious. p. 206. ↑ Izz al-Din ibn Hibatullah ibn Abi l-Hadid. Comments on the Peak of Eloquence (Ibn Abi al-Hadid) Vol. 3. p. 351. ↑ Nasr, Seyyed Hossein (2007). "Ali". Encyclopædia Britannica Online. ↑ "Sayyid". Encyclopædia Britannica Online. 2007. Retrieved 2007-12-01. Al-Bukhari, Muhammad. Sahih al-Bukhari, Book 4, 5, 8. Al-Tabari, Muhammad ibn Jarir (1987–1996). History of the Prophets and Kings, V.2. SUNY Press. Nahim, Hassan A. (28 August 2012). The Division After Prophet Muhammad. Xlibris Corporation. ISBN 978-1-4771-4800-6. Morrow, John Andrew (11 November 2013). Islamic Images and Ideas: Essays on Sacred Symbolism. McFarland. ISBN 978-0-7864-5848-6. Chittick, William C. (1981). A Shi'ite Anthology. SUNY Press. ISBN 978-0-87395-510-2. Ordoni, Abu Muhammad (2012). Fatima (S.A.) The Gracious. Ansariyan Publications. Armstrong, Karen (1993). Muhammad: A Biography of the Prophet. San Francisco: Harper. ISBN 0-06-250886-5. Ashraf, Shahid (2005). Encyclopedia of Holy Prophet and Companions. Anmol Publications PVT. LTD. ISBN 81-261-1940-3. Ayoud, Mahmoud (1978). Redemptive Suffering in Islam: A Study of the Devotional Aspects of (Ashura) in Twelver Shi'Ism. Esposito, John (1990). Oxford History of Islam. Oxford University Press. ISBN 978-0-19-510799-9. Madelung, Wilferd (15 October 1998). The Succession to Muhammad: A Study of the Early Caliphate. Cambridge University Press. ISBN 978-0-521-64696-3. Esposito, John (1998). Islam: The Straight Path (3rd ed.). Oxford University Press. ISBN 978-0-19-511234-4. Fadlullah, Sayyid Muhammad Husayn. Fatimah al-Ma`sumah (as): a role model for men and women. London: Al-Bakir Cultural & Social Centre. Ghadanfar, Mahmood Ahmad. Great Women of Islam. Darussalam. ISBN 9960-897-27-3. Encyclopædia Britannica Online. Encyclopædia Britannica. Amin, Hassan (1968–73). Islamic Shi'ite Encyclopedia. Beirut: SLIM Press. Vacca, V. "Fāṭima". In P.J. Bearman; Th. Bianquis; C.E. Bosworth; E. van Donzel; W.P. Heinrichs. Encyclopaedia of Islam Online. Brill Academic Publishers. ISSN 1573-3912. McAuliffe, Jane Dammen; et al., eds. (2001–2006). "Fāṭima". Encyclopaedia of the Qur'an 1st Edition, 5 vols. plus index. Leiden: Brill Publishers. ISBN 90-04-14743-8.